If you still need help or your problem isn't on the list, put in an IT Request ticket. OR, check out our Advanced WCMS topics for more information. I get an error message when logging in. No user account in WCMS. You have to be set up in the system with a user account. Contact your web site manager who can add you. CruzID Gold password is not set up or is incorrect. Create or reset Gold Password. My pages ARE publishing and I don't want them to. My content block won't publish! I get an error message that says "An error occurred during publishing: The folder hierarchy does not allow this asset to be published. " Content blocks don't publish. Anything inside the content-blocks folder won't publish. You only publish the page on which the block appears. For all homepage blocks, publish the home page (index). For the department title, footer links, left nav and top nav blocks, publish the whole site (base-folder) as these blocks appear on every page in your site. How do I publish my whole site? To publish your entire site, simply select the "base-folder" and then click publish. This publishes every folder, page, and file that is set to publish. When do I need to publish my whole site? Doing a full-site publish is needed when you changed a department title, top navigation, footer link or global left nav content block as these blocks appear on every page in your site. It's also a good idea to publish your whole site when you have done a lot of re-architecting and rearranging of things in your site. Publishing updates the links throughout the site. How do I change the order of the items in my left navigation? How do I change the text of the left nav item? Changes to your left nav require a re-publish of the entire folder. A campus news article appearing on my web page has nothing to do with my department. The categories are applied by the article author when the article is created. Contact the author listed in the article. Campus news articles are not showing up on my news index page. The campus news articles have categories and not all departments, programs or units are represented. To see what categories are available, see the RSS page. If there ARE stories available in the category desired above but still aren't showing up on the news index page, submit a ticket. 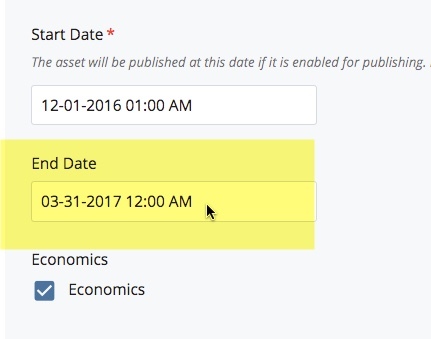 This means that your news, event, or featured profile article has an end date and the system is warning you that after that date, the article will no longer appear on your "index" page (see image below). Please replace your old directory pages with the NEW directory page type. If your site still uses the old directory page types, the content comes directly from the Campus Directory. Nothing is showing up in the WCMS for the directory page. This is normal. It will appear on the web. If it doesn't, publish the folder where the directory pages reside. The link from the directory page to the person's profile doesn't work. You need a file called "singleton" in the same folder as your directory page. You may have another folder in the site with this file and you can copy this file. If you don't have a "singleton" file in your site, submit a ticket. All person types come from the central campus Identity Management System and can't be changed by users. We have likely configured something incorrectly. Submit a ticket. If you don't know how to embed Google products such as a calendar, instructions are available. If you confirmed that you have copied the correct code from the Google calendar, make sure that the share settings are set correctly. Oops, I deleted an asset and I want it back! 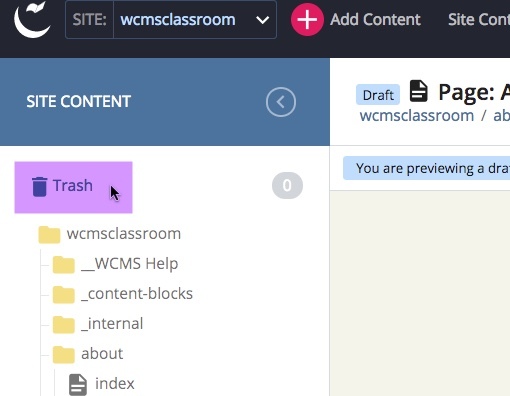 Once you're in your site in the WCMS, click the "Trash" link above your folder structure. All deleted items remain in the Recycle bin for 30 days. Can I Find and Replace Text? Unfortunately, you can't. You can "find" something on a page by clicking Ctrl "F" but there isn't a way to replace it with other text. I created a page with only an image on it and it's blank! The style sheets do not allow image-only pages. There has to be some text. A way around this is to put a period at the bottom of the page and re-submit and publish. Your image should appear. I'm trying to upload a file and it freezes? Most likely, your file is too big. The maximum file size for uploading is 10MB. With a very few exceptions, files should be no more than 1MB. Please resize and/or optimize your file prior to uploading. I got rid of a PDF/page from my site but I can still see it on my site! The page didn't get unpublished when you moved or deleted it in the WCMS. This means it's orphaned on the web server. All you need to do is recreate the same page with the exact same system name, publish it and then unpublish it. If you have recently deleted pages from your site or changed page names and they are still showing up in Google's index this is perfectly normal. It will take some time for Google to re-index your site and see that there have been changes. When these changes are detected Google will remove the pages from their index and put in the new. This can take some time, but will eventually happen and is out of our control. Help! All the text on my news article is huge! This happens when there isn't a title entered in the title field. Enter a title and that should fix it. Accessibility note: All pages should have a title. How do I set a Review Date for a page on my site? To have this feature activated, put in an IT ticket and we'll activate this feature for your site. Where are the capital letters in my file name? Capital letters in file names will be automatically changed to lowercase upon upload. Page, folder and file names should always follow naming conventions: no capital letters, no spaces and no special characters.